Home > Throat Infections > What is Quinsy? Often mistaken for common tonsillitis, quinsy has the potential to be very serious. Although it may begin with the same symptoms as tonsillitis, it is generally a worse form of the complaint and in the worst case may endanger life. 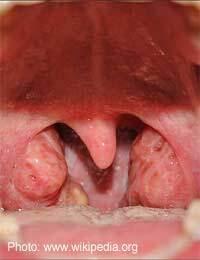 Quinsy is a common name given to peritonsillar abscess formation in the tonsil area. It affects people in their late teens and adulthood and usually affects one tonsil more than the other. It has the potential to be very dangerous if left untreated. Peritonsillar abscesses start as a sore throat and inflammation of the tonsils. It develops into pus filled abscesses on the tonsil area making swallowing very difficult and extremely painful, sometimes nearly impossible. Along with this, there is often a high temperature and a general feeling of being unwell. You or those around you may have noticed a foul smelling breath odour and a visible swelling to the neck area. It is also likely that you will suffer from referred pain in the ears and neck area in general and a distinct change in your vocal ability and normal sound. With quinsy, comes a lot of swelling of the area and surrounding tissues. This is what makes it so difficult to swallow and causes the pain. As many healthcare professionals are now convinced that most sore throats, even very bad ones, will heal on their own, people are afraid to go to their doctor with a sore throat complaint meaning that there is the potential for the condition to go undiagnosed until it becomes dangerous; quinsy, however is not very common these days. If your doctor thinks that you have a mild form of quinsy or typical Tonsillitis, you may be fortunate enough to be offered a course of antibiotics which will help the body fight the bad bacteria away and reduce the swelling and abscesses. For others though, surgery may be necessary in which the abscess is incised and drained and a course of antibiotics is given after the procedure. This will require a visit to hospital and the use of a general anaesthetic while the procedure is being carried out followed by the antibiotics and pain relief. This condition carries several dangers, some more serious than others. In the worst case scenario, the individual may have a large, pus filled cavity to their tonsil which has the potential of bursting at any time. If this happens, the person may inhale the contained pus as they breathe, in which case the poison can enter their lungs; this is known as aspiration. It is made worse by the fact that the fluid they are inhaling is infected, it is thick and the body is already struggling to fight off the bacteria. When a person aspirates their lungs are a lot less able to function properly as the lungs cannot exchange oxygen and other gases as well as the fluid is preventing this natural action; in the worst case, this can cause severe damage, sometime irreparable. If suspected, quinsy should be treated as an urgent medical case and you should go and see your doctor urgently for treatment. If you are worried about contracting Quinsy or would like to know more about it read our article on Can You Still Get Quinsy? Monday i came down with an awful lump on the left side couldnt get in doctors. I was throwing up my temperature was through the roof but i was cold. I was dizzy and kept passing out. Could drink or eat or take tablets got into doctors on tuesday snd got transfered to james cook as an outpatient with quinsy which i had never heard off. Then i got admitting and got pumped full of liquid steroids. Liquid Antibiotics, liquid paracatmol and bags of fluid it took them 5 goes to find a vein that didnt collapse cause i was so dehyrated and spent the night in hospital i was lucky in this occasion as i caught it quick enough for it not to drained a day later and it would have been it was still big and sore n full of puss though. I'm feeling your pain right now. 7 days ago I went to the GP for a sore throat. She confirmed tonsillitis and sent me away with ABs and suggested Paracetamol and Advil. After 24 hours of chewing these like popcorn I went to ER. They say the infection but said no quinsy. They treated with steroid, iv antibiotics and morphine. I was discharged with oral abs and stronger pain killers. Within 24 hours i was back at ER after maxing our on the recommended doses of the painkillers. They assured me to persist it will go away. I went home for 4 hours tearing my hair out. Came back and a new doctor in ER identified the quinsy. They calledan ent doctor who lanced it then cut it. He said not much came out. It did feel better and I was admitted overnight to get iv ABs. The next morning discharged but within 12 hours i was back in ER with even worse pain radiating up my neck, ear tonsils, teeth and jawline.I think they thought I was nuts. It took hours to even get a painkiller and 6 hours for the ENT to come back toER. This morning he aspirated the area around the initial incision and pulled out 5ml of pus. It was almost instant relief. I've been relatively pain free for 12 hours now, but I know it's building again. Under the jaw is swelling again and the tonsils are becoming increasingly tender. Still nothing like before but I can see it on the horizon for tomorrow morning. I will make him drain it again. Why won't this thing just die. It's like 4days of iv ABs and 3 of oral ABs, two lancing and drains??? I had a burst quinsy in September, worst pain ever and baffled the drs as I have never even had tonsillitis! The worst thing for me has been the recovery, my blood infection levels were apparently very high (508) and I am still very tired 2 months later...I have scar tissue from the large hole in my mouth the quinsy caused and it feels like I have something stiff in the back of my mouth every time I swallow. I havenot found much information about after care so not sure if this is normal ?? I had my tonsils out many years ago. By the age of 24 I had had tonsil issues and quinsy around 5 times a yr each year from the age of 19...age 24 I had them out, a week later, on holiday I'm in agony, I have infection in there, so I get anti bi from the local small hospital, 2 days later, the anti bi have killed the infection which was sealing a vein up, I was bleeding out from the back of my throat, a speedy trip toa large hospital at 4am and I'm back under been re cauterised.....BUT after all that...im kinda glad I had them out...in 24 yrs I haven't had an issue at all. I think I may have quincy but I'm not sure. I have recurring tonsillitis but this time the pain is much worse you can't see my tonsil anymore it's just filled with yellow pus, my gland on one side is very swollen and I'm having pain in my ear. I have tried difflam spray and it hasn't work the infection is still there, I can't go to the doctors for at least 4 days as I'm on holiday any suggestions on what I can do?? My daughter is really poorly with tonsillitis symptoms but she has had Quincy once before and had to be admitted. She has a large lump behind her tonsil and clacker. Tried to get a doctors appt but she could only see a nurse who told her to take painkillers, she has no gall bladder so unsure which meds she can take. Thinking of taking her to A & E as after 4 days she is not getting any better. Hi all,Update on my comment from last year - I had a tonsillectomy and my instincts were right.I had a quinsy hiding under my left tonsil which is why my throat was so swollen and the infection wasn't going! It had been sitting there since August the previous year - which is actually really dangerous apparently.Honestly, having my tonsils taken out was the best decision I ever made so if you have the opportunity, I really, really recommend it!! (It is 2 weeks of pure hell afterwards while you recover but the end result is so worth it). I had the operation in the beginning of July 2016 and haven't had so much as a sore throat since! The removal of tonsils perhaps may not work for everyone - but it's great it has worked for you. We hope you remain sore throat free from now on. Hi all, Update on my comment from last year - I had a tonsillectomy and my instincts were right...I had a quinsy hiding under my left tonsil which is why my throat was so swollen and the infection wasn't going! It had been sitting there since August the previous year - which is actually really dangerous apparently. Honestly, having my tonsils taken out was the best decision I ever made so if you have the opportunity, I really, really recommend it!! (It is 2 weeks of pure hell afterwards while you recover but the end result is so worth it). I had the operation in the beginning of July 2016 and haven't had so much as a sore throat since! Hi well I am in hospital right now on IV antibiotics and pain killers. This whole thing has really caught me by surprise. Im a healthy 23 year old male which has never really suffered any issues with my tonsils or throat but started feeling pain in my right tonsil only 6 days ago. At first thought nothing much of it. After 2 days though it had already deteriorated much beyond that of a sore throat and I had a new found respect for people who suffered from tonsilitis as the pain was unreal and was only about to get much worse. It was about 2 days ago where I decided this wasnt a normal infection and went to my GP who put me on some extremely strong oral antibiotics and told me head straight to A&E if anything gets worse. Well after taken a day of the medication my throat had swelled so much and became constantly filled with mucus and puss that swallowing wasnt possible and I became very anxious about my capabilities to breath so headed straight to A&E. Since then had a syringe and needle attack the infected area and then a scapel cut it open. The scapel was much more effective and comfortable as job was done quickly. I am on anti inflamatories, morphine should I wish to have it and just your general fluids. Thank god I came to hospital is all I can say because all I know for sure was my problem continued to deteriorate and the pain was just something else. If I wasnt embarrased about going to hospital over a sore throat I would have came sooner and not allow myself to get to the border of needing intervention. For the first time in 5 - 6 days Im finally comfortable again. Just been discharge from hospital after being treated for "Quinsy" Oh my days, what a painful illness and the treatment wasn't pleasant either but relief was immense once they lanced it. Was misdiagnosed initially by my first doctor, sent away with tablets that didn't touch the infection. My throat, ears and swallowing were so painful, couldn't swallow my spit in the end. Foul tasting mouth, was effecting my voice, difficulty opening my mouth, eating was impossible. Happy when I was asleep and dribbling which wasn't often as I was in too much pain, cried a lot as the pain in unbearable. Went back to the doctors and saw my other doctor who had this herself she immediately referred me to hospital, went home packed a bag and went in. After the camera down my nose and three lancing injections in my throat to remove the pus and a 26 hrs in hospital on an IV receiving strong anti-biotics, steroids and saline, feeling a lot better. 10 days course of tablets, two types and hoping that I never get that this again, if you think you've got this go straight to the doctors, it's dangerous the cyst bursts and the pus enters your lungs. We are just glad you have now recovered and it is all but a horrible memory! Your experience sounds awful. Just been discharge from hospital after being treated for "Quinsy" Oh my days, what a painful illness and the treatment wasn't pleasant either but relief was immense once they lanced it. Was misdiagnosed initially by my first doctor, sent away with tablets that didn't touch the infection.My throat, ears and swallowing were so painful, couldn't swallow my spit in the end. Foul tasting mouth, was effecting my voice, difficulty opening my mouth, eating was impossible. Happy when I was asleep and dribbling which wasn't often as I was in too much pain, cried a lot as the pain in unbearable. Went back to the doctors and saw my other doctor who had this herself she immediately referred me to hospital, went home packed a bag and went in. After the camera down my nose and three lancing injections in my throat to remove the pus and a 26 hrs in hospital on an IV receiving strong anti-biotics, steroids and saline, feeling a lot better. 10 days course of tablets, two types and hoping that I never get that this again, if you think you've got this go straight to the doctors, it's dangerous the cyst bursts and the pus enters your lungs. Hi- I can feel your pain. I had quincy when my daughter was 2mnths old. I spent days and nights crying infront of my basin as I was so thursty but couldn't get a drop of water. To go down my throat not even my own spit. Went to the clinic, they took one look and refured me straight to the hospital where I got given antibiotics interveinesly for 3 days straight. I thought I was gonna die. Doctor said I had tonsillitis but that he thinks it'll go without antibiotics and to have difflam spray and ibuprofen. It has not helped at all, the spray is stinging AMD doesn't numb or make it better. It's been over a week my ear hurts I can barely swallow, my breath smells of meat (embarrassing) and my tonsil still only hurts on the same side of ear BUT has shrunk in backwards like there's no tonsil there. I only find stuff on enlarged tonsils, could it still be quinsy with a shrunken eroding looking and feeling tonsil? I've had quinsy twice now and have realised that not many doctors know about this very much. It was around back in the days but not as much now but looks like it's on a come back. Just wanna say if you feel weak, ears and throat hurting plus your in a lot of pain? Then go to hospital cos it's a waste of time going to the doctors. If you are unsure whether you feel well enough, then your doctor will be the person to advise whether or not you should return to work. We are glad the information has helped inform you of the warning signs and symptoms. On Wednesday I started to feel abit un well my full body was aching and mu throqt and ears,I got prescribed antibiotics on the Friday, I have to take eight a day its now my third day of taking them and I don't feel any different my ears are still really hurting me aswell as my throat, I havnt been able to eat for four days and a massive headache, I'm hoping its tonsillitis but since ive been reading this I think I might have Quincy,help? I was prescribed Strong Penicillin tablets for tonsillitis, have finished Course. GP said it would dissolve. White pus lump still there, might be tiny bit smaller, unless that's wishful thinking. The antibiotics were so Strong I halved the dose & therefore it took that much longer, but, still there. I sneeze a lot @ times & have a chesty cough & just feel tired/achy all the time. What do you think I should do, give it more time? Please advise me if you can honestly as beginning to get on my nerves now, thank you!